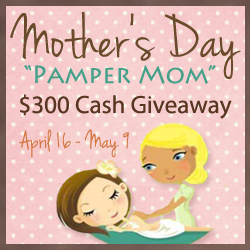 I'm SO excited to be celebrating motherhood by being part of this awesome giveaway! "Of all the rights of women, the greatest is to be a mother" by: Lin Yutang, Chinese writer We are Thankful for our Readers and we would love for you to win some cash to make your Mother's Day extra special The Freebie Junkie and Children Teaching Mama are joined by other fabulous bloggers in offering 1 lucky reader the chance to win $300 in our Pamper Me Cash Giveaway event The cash giveaway is open to all worldwide and will be paid directly into your paypal account What would you do with $300? Splurge on a new wardrobe? Spend a day at the spa? Enroll in a new class? Take a family away for the weekend? I'd probably spend some on bills and some for new shoes. I would pay off some bills first. Then I would splurge a little. Well I need a new pair of shoes and then the rest I would use to do something with my family. I would put it towards new carpeting.